This dish is actually called, Kitchari which is a staple comfort food in India. The word “kitchari’ means “mixture” or “mess” as in “mess of pottage” or “mess of stew” or porridge. Judging from the picture below you can tell why… but I am here to tell you why you should try this jumbled mess – it is medicine. The main ingredients are rice and mung beans, to which a variety of spices- cumin, coriander and turmeric are added for flavor. ancient medical practice of India dating back 5,000 years, this mix of rice and mung beans is considered extremely easy to digest and is said to purify the digestion and cleanse the body of toxins. Kitchari fasting is actually a mono-diet, which means the body receives a limited diversity of foodstuffs and therefore needs to produce a limited number of digestive enzymes. The work of the digestive system is lessened, allowing for greater healing and cleansing to occur. Kitchari tastes like a cross between a creamy rice cereal and a light dal. If it is a cold, blustery day or you are feeling under the weather, a steaming bowl of this classic Indian comfort food can both warm up your bones and restore sagging energy. In a large saucepot under medium high heat, pour the mung beans, brown rice and cold water together. Bring to boil and then reduce heat and cover for 45 minutes. In the meantime, in a skillet; heat oil and fry the salt, cumin, coriander and turmeric until fragrant. 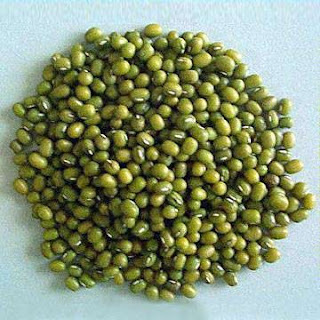 Pour into the mung bean mixture and combine well to fuse all ingredients together nicely. To the finished product you can top with some chopped up fresh ginger (good for circulation), a couple tablespoons of plain yogurt…and squeezes of lime.